Ivonne’s energy never ceases. A seasoned broker who grew up and started her business in New Jersey in 2005, she made a bold move in 2010 when she moved to NYC. She immediately began to immerse herself in all that New York has to offer. It was an easy transition given that her New Jersey real estate background specialized in residential marketing, listings, and sales. That experience made it natural for her to sell townhomes. “I was groomed to list and sell houses; that’s all I knew,” she says. 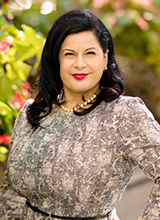 Prior to real estate, Ivonne worked as a home furnishings consultant for two of the largest retailers in the nation. In order to guarantee her success she studied architecture, design, styles, history, and Feng Shui. She also dabbled in other industries including public relations, fitness, and entertainment. She brought her knowledge in all these disciplines to her real estate career, which is the field that ultimately fulfills her. She found success quickly by being named Rookie of the Year and making the Circle of Excellence for four consecutive years. Knowledge, compassion, connections, and local market statistics continue to be the anchors for her success. Informed, trusting, and happy clients will always be her focus. Ivonne maintains her energy, focus, and smile through regular workouts of Bikram yoga, meditation, and strength training. She is passionate about wellness and maintains mindfulness towards all its dimensions. She also volunteers with local community organizations. “Almost 7 years ago we met Ivonne when she was a realtor in NJ. My +1 and I thought that we would be living in NJ for the foreseeable future and would then commute to NY for work. She showed us at least a half dozen properties in many different towns. In any event life took a turn and my +1 decided to join the military. So plans of putting down roots in the northeast were put on hold. For the last 4.5 years we have lived in a few different places North Carolina, South Korea, but we always knew that NY was were our home would be. NY was the place we met, fell in love, got engaged and the place we knew we wanted to raise our family. So, in the beginning on 2014 we decided to make the permanent move back. Through Facebook we saw that Ivonne was still in the real estate game, and we knew that we had to reach out! She was here in NY with a new company and ready to jump back on board with us, we couldn't have been happier! We thought that our wish list would never be able to stay completely intact, that we would have to severely compromise. But we were wrong, we got everything we wanted! It took 5 months, 12+ properties, 3 offers, a heartfelt letter and one tenacious agent and we finally purchased our forever home! Ivonne not only worked with us, she fought for us! She went to battle to get us what we wanted. She put in the time, time and more time to get our voice heard. She listened to our wants, wishes, dreams and concerns and together we got the job done. Ivonne is the type of realtor that will take each listing like she is the buyer and/or seller. She looks at the process from all sides and is fair and true in her actions. Ivonne has become part of our family. If we ever decide to jump in the race again and move (15 years from now) Ivonne will be the only one we call! She is a great asset to your team and to the human population at large!” - Lanita & Rakiyah W.